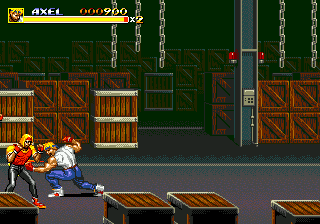 The final Streets of Rage game is a polarising one. While the first two games in the series are universally praised as classic beat-em-ups, the third game just doesn’t get the same amount of love. This might be because depending on whether you’re playing a Japanese or a Western version of the game you’re in for a quite a different experience. 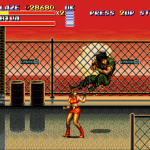 For this review we are referencing the Japanese version of the game which is colloquially known as Bare Knuckle III. 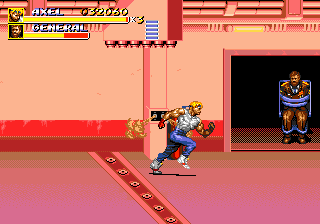 There are some important differences in the Japanese version that make this game feel like more of a proper Streets of Rage sequel than its Western brethren. 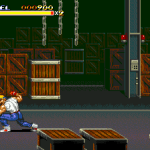 For starters, the character sprites use the same colour palette as Streets of Rage 2. Another throwback to the previous game comes with Axel’s blitz move. Axel shouts, “grand upper” when he performs the attack, much like the previous game. This is bizarrely changed to, “bare knuckle” in the Western version. The plot is also based more heavily on Mr X committing a terrorist act by kidnapping a military general and seizing a new type of explosive so he can start a global war. This shift in tone is far more serious than the Western version’s focus on Mr X replacing city officials with robot clones which feels far more like a rubbish, eighties sci-fi. So the tone in Bare Knuckle III definitely feels more true to the series, but what of the game? The gameplay is arguably the best in the series. Combos are much faster to perform, you can now run with all characters, you can roll in and away from the screen and there’s a surprising increase in depth. Blitz moves can be levelled up as long as you don’t lose a life which means your arsenal of attacks increases as a reward for expert play. Also added are blitz moves that are exclusive to weapons. 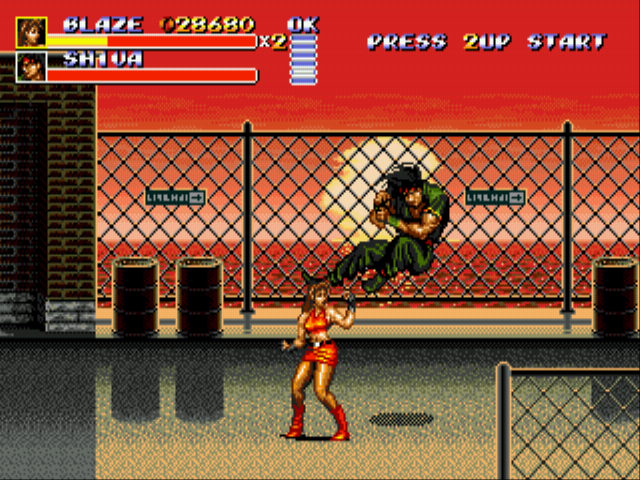 For example, activating a blitz move while holding a katana leads to a devastating uppercut with the blade. The enemies have also seen a significant upgrade. Enemies now have the ability to block, team up for tag-team attacks and even steal health items if they’re left exposed. These additions along with the ones made to your own character make Bare Knuckle III the most fully-formed beat-em-up in the series and it’s an absolute joy to play. Unfortunately there are two slight negatives that stop the game from being the best in the series. The first was actually corrected in the Western release and that’s the inclusion of Ash. Ash is a mini-boss in the first stage of the game and an obvious homosexual stereotype. His inclusion in the Japanese version is an unfortunate by-product of the past and his appearance is at odds with the game’s more gritty tone. The second problem deals with the soundtrack. 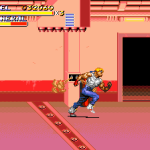 Yuzo Koshiro made his mark on video game music history with the soundtracks to the previous two Streets of Rage games. His early adoption of trance and club music is now seen as revolutionary and the melodies in those games are extremely memorable. Bare Knuckle III attempts to take this further by adopting a harder, drum ‘n’ bass sound but it loses the melody in the process. It’s a massive shame because the right soundtrack could have really elevated the gameplay experience. Otherwise the game’s presentation is wonderfully solid. The character sprites are beautifully animated and look more detailed as a result. There’s a huge variety of areas to explore and they’re realised with some of the best art design to grace the series. There’s a bolder use of colour on display throughout the game and it really makes the whole experience pop. Overall, Bare Knuckle III is a significant improvement over the previous game. Gameplay is far more dense making the experience an easy-to-learn but difficult to master affair. The stages are extremely varied and there’s a huge amount of different enemies and bosses to encounter making the game gloriously unpredictable. Unfortunately, the poor soundtrack and inclusion of a particularly offensive character taint the experience somewhat. This would be an obvious win for the Western version as it doesn’t include Ash (at least as an enemy) but the change in tone makes it feel strangely inferior and less of a Streets of Rage game, especially when compared to the Japanese version. Bare Knuckle III is an excellent beat-em-up that’s tarred with some poor decisions.